I’m always on the hunt for hair products that can transform my dry, slightly frizzy ends into something more sleek and presentable. I do like a serum for the quick-fix appeal and instant shine that it gives (most-used is probably Toni & Guy’s Tropical Elixir), but when I want to feel as though I’m adding moisture to my hair rather than merely coating it in slippery stuff I use a styling or “grooming” cream. When I was just a sproutling model, back in the year-whatever (2001?) the styling product du jour was Kiehl’s Creme with Silk Groom, a sort of heavy-duty conditioner that seemed (in the right hands) to turn crap hair into dishevelled Kate Moss hair. Now, I say “the right hands” because in the wrong hands (ie mine) it just made hair slightly stickier than it was to start with and still dry in all the wrong places. Well move over, Creme with Silk Groom, if you even still exist, because there’s an easy-to-use works-every-time styling cream in town. 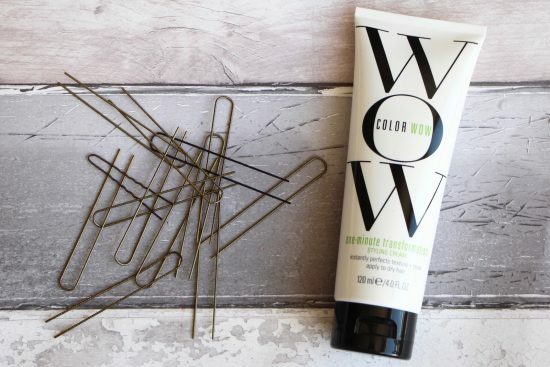 Color Wow’s One-Minute Transformation Styling Cream, which actually transforms in less than a minute, should you be feeling particularly low-key – just use it as you would a leave-in conditioner and smooth it lightly onto frizzy ends and unruly lengths. If you can spare the full sixty seconds, apply to frazzled sections (wet or dry) and blow-dry with a round brush to give yourself incredibly smooth and manageable hair. Top stuff. It’s my new everyday hair-saver, with my Colab Active dry shampoo in the roots and my Color Wow through the ends. I have my hair colourist Nicola Clarke to thank for this discovery (she does Kate Winslet’s hair, Kate Moss’s hair, Cate Blanchett’s hair and loads of other people who are called Kate – I almost feel I should change my name) – she’s the creative colour director for the brand and is great at finding products that work well on bleached, slightly battered-about hair. The damage on this one? £16.50. The One-Minute Transformation seems to have sold out at Space NK but it’s at Amazon here and there’s also a smaller, trial size for £9 if you didn’t want to jump in with both feet.